Elf Owls do not have "ear tufts" or feathers on the top of their rounded heads. Their feathers are grayish brown in color. Their eyes are pale yellow and are highlighted by thin white "eyebrows". The bill is gray with a horn-colored tip. Elf owls are the smallest owl in the Sonoran Desert. Elf Owls, like other owls have excellent night vision. They can't see in complete darkness, but they can see quite well in low-light. They also have excellent hearing. They can catch their prey in complete darkness, by pinpointing it using their ears rather than eyes. Elf owls have "silent flight" which means they don't make any noise as they approach their prey. The sound of their wing beat is muffled by softened feathers on the leading edges of their wings. In the Sonoran Desert region, elf owls are found mainly in riparian habitats (places where there is water), or in areas where saguaro cactus are plentiful. Elf Owls are found from the southwest USA to Central Mexico and Baja California. Northern populations winter in Central Mexico and on the Pacific slope north to Sinaloa, Mexico. The most important threat to the elf owl is habitat loss both of its riparian forest habitat and desert-scrub habitats. 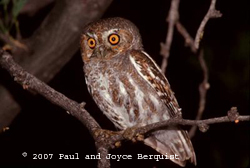 In Arizona, the elf owl is not uncommon, but it's numbers are decreasing in California and Texas. They feed primarily on invertebrates such as moths, crickets, scorpions, centipedes and beetles. Elf owl predators can include other owls, snakes, coyotes, bobcats and ringtail. Most predators find it difficult to access the owls nest high up in a saguaro. Elf owls nest in natural tree cavities and abandoned woodpecker holes that can be found in giant cacti, oak trees, and sycamores. The nests are about 15 to 35 feet from the ground. The female elf owl will lay 2 to 4 white eggs. In the wild, elf owls live 3-6 years. In captivity they usually live longer, between 6-10 years. When captured, this tiny owl will play dead until all danger has passed. They are not very aggressive, preferring to fly away rather than fight. Because it can be too cold in the desert for many nocturnal insects, the elf owl will migrate to Mexico during the winter. Compare with a Barn Owl of the Australian Desert.